What is FIRST? To understand the purpose and goals of FIRST you first have to understand the goals of Engineering and then FIRST makes perfect sense. Simply stated, Engineering is a process for creative problem solving. Over 25 years ago Dean Kamen, among others, realized that the United States was not developing sufficient graduates from STEM (Science Technology Engineering and Math) related fields to be competitive in the technical job market. Using his Engineering skills Dean looked at the situation as a problem and applied creative thinking to propose a solution. Dean asked, “what do students like to do?” and identified arena sports and rock concerts as popular entertainment. Dean took these two venues and added a technical challenge to inspire young students to choose to play in the domain of STEM. Take a look at the following two videos from the 21st Kickoff to hear Dean Kamen, Founder, talk about “What is FIRST?” and Dr. Woodie Flowers, Chief Engineer, talk about “Why FIRST?“. If you want to see a couple snapshots of what FIRST is all about, take a look at these videos. FIRST is Engineering in Practice. 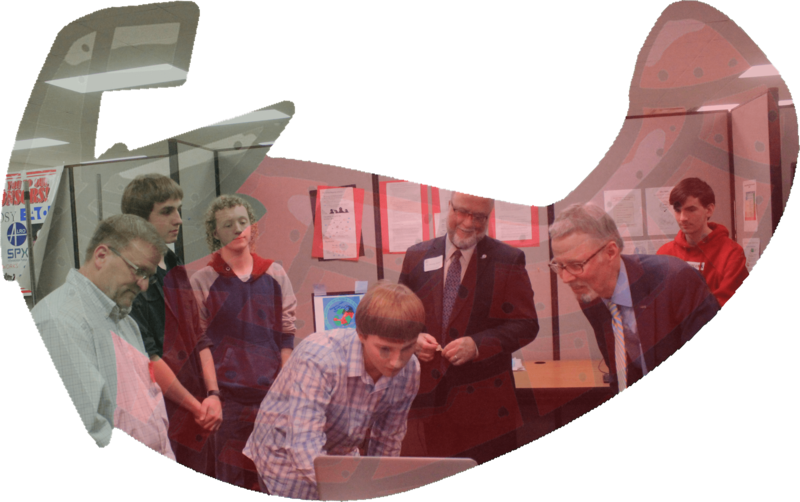 Our State Superintendent, Michael Flanagan, visited the Red Hot Chili Bots’ headquarters on February 18. A representative group of our team walked Mr. Flanagan through our program and demonstrated the essay editor tools we have been using to create our robot for this year. We also talked about the positive impact it has had on each of us. This year our team has accelerated in the use of Computer Automated Design (CAD) to design and validate many parts of our robot prior to building. It was fun to have the opportunity to talk with Mr. Flanagan about our successes. In First Stronghold you and your alliance must breach your opponent’s defenses attack their tower with boulders and eventually capture their base. Different obstacles along the defenses, known as the outer-works, will either stay still or change periodically. Such as low bars, low bars will not be moved during the entire match. A rough ground defense is moved at some occasions from time to time, elected by the audience. The remaining obstacles are picked strategically picked by the alliance, this can be arranged in 10,000 different ways! Robots start in the neutral zone, having one boulder each. After that boulders will be placed on the mid line. One robot can be placed in the opposing team’s field as a spy bot. Robots begin in autonomous mode receiving points from getting through the outer-works and scoring goals. Following human drivers will pilot the robot. Obstacles and towers will lose points and once all points are lost, they will be conquered. Climbing the tower will capture it and win additional points. In First Steamworks your club must power machines using gears and fuel. The team that is most prepared when the timer hits 0 is the winner. Robots can hold up to 10 fuel and 1 gear in the beginning. Fuel are also available in hoppers and in the alliance loading station. The first match is autonomous. Robots work to reach the baseline, fuel tanks, and bring gears to the airships. Human drivers then operate the robots. Alliances earn more points by creating more steam pressure. Gears are added to rotors on the airship. More gears can earn more points. Lastly robots will secure themselves aboard the airships and take off! In First Power Up alliances use power cubes to control scales and switches, exchange power cubes for power ups and face the boss. Power cubes are set to one for each robot, and are along fences, cube piles, and in portals. at the beginning switches are randomized. Robots start autonomous and receive points by crossing an auto line, and place power cubes on a switch and scale. The human operators remotely control robots. For every second a scale or switch has the most cubes on your teams side you are given a point. Power cubes are collected for a power up such as force, levitate, and boost temporarily for an advantage. Force gives an alliance ownership of their switch and/or scale. Boost increasing scoring for ten seconds. Levitate earns a team a free climb at the end of the match. If all three robots and climb to face the boss they win additional points. The alliance that has overall earned the most points will be able to face and defeat the boss. Causing them to win! The Robotics program is funded by team fund raising efforts, local corporations, and grants. Please visit our Donate page to learn more about how you can help the team.